Facility was entered into the US Department of Energy’s FUSRAP program due to earlier operation for US Navy. Soil and sediment excavation from Site Brook required clearing and grubbing, access road construction, bypass pipe installation, water management, and wetlands restoration. 4 acre debris pile removal required clearing and grubbing, excavation, transfer to staging pad, screening, segregation, and restoration. Removal of an existing waste line was required. Stringent USDOE radiological protocol was required for the duration of the project. The Combustion Engineering Facility opened in 1956 as a research, development, and manufacturing facility for nuclear and fossil fuel. Operations were conducted under contract with the US Atomic Energy Commission (AEC) until the early 1960s. On-site operations included manufacturing of commercial fuel rods, nuclear and fossil fuel labs, and experimental coal gasification testing. Radiological residues, uranium as well as chemical wastes were generated from operations. The presence of uranium and cobalt at the site from work for the US Navy enabled the facility to enter into the US Department of Energy (DOE) Formerly Utilized Site Remedial Action Program (FUSRAP). Later, Combustion Engineering also entered in the RCRA Voluntary Corrective Action Program. The cleanup, which has been ongoing since 2000, will allow for future redevelopment of the facility. Sevenson was awarded this phase of the remedial action on a competitive bid basis. Sevenson initiated development of project plans as well as a preliminary schedule upon receiving notice of award. As soon as the notice to proceed was received Sevenson began mobilization. This included delivering equipment and supplies from Sevenson’s primary yard in Niagara Falls, New York. Staging and laydown areas, truck decon facilities, and office trailers were established. This phase of the project required careful attention with regard to clearing operations especially in the wetlands areas. In areas outside of the contaminated excavation areas, trees were cut down as close to the ground as allowable so root structures could be left in place and access roads could be built over top. Grubbing only took place within the contaminated excavation areas. 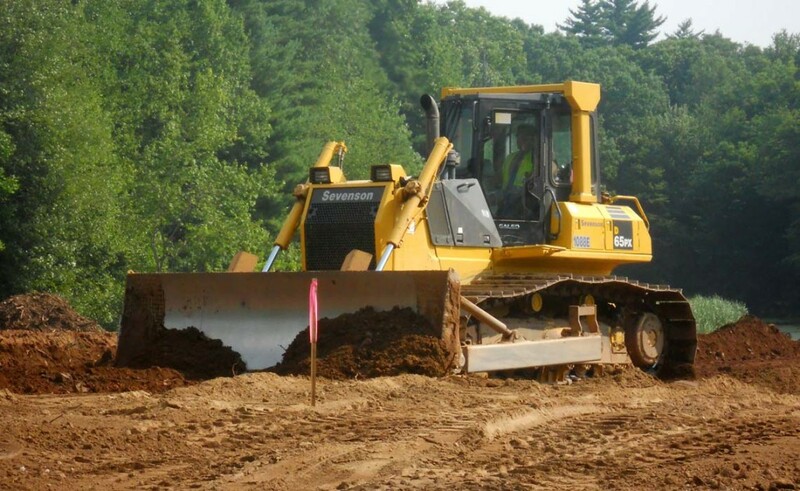 Tree stumps were scanned for radiological contamination and disposed of as required.Once clearing was completed, Sevenson utilized a bull dozer to strip and stockpile topsoil for re-use from within the foot print of the road. Once the areas were stripped and graded, a smooth drum roller was used to stabilize the subgrade prior to the installation of woven geotextile fabric and placement of 6 to 12 inches of stone. When the access roads were constructed, silt fence was installed on both sides of the entire length of roads, around the perimeter of exclusion areas, and around the material staging pads to prevent run off. Hay bale sediment barriers were also installed on the downstream side of each excavation area.Sevenson installed bladder dams on the slopes to divert clean run off water away from the excavation areas. 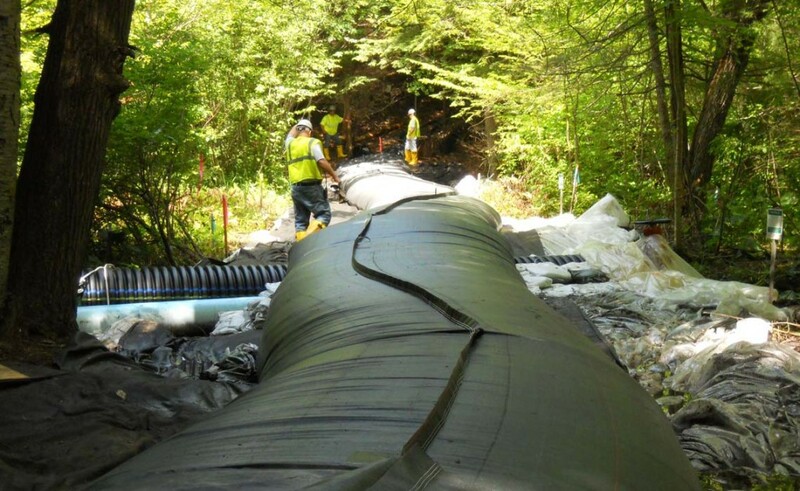 At the outfall, a silt curtain was installed as an additional measure to control any sediment migration past the primary control measures installed up stream. Once an excavation area was opened, but not yet verified as clean, it was covered with 6 mil plastic and sand bags to minimize any contact with and prevent potentially contaminated sediment from migrating downstream. 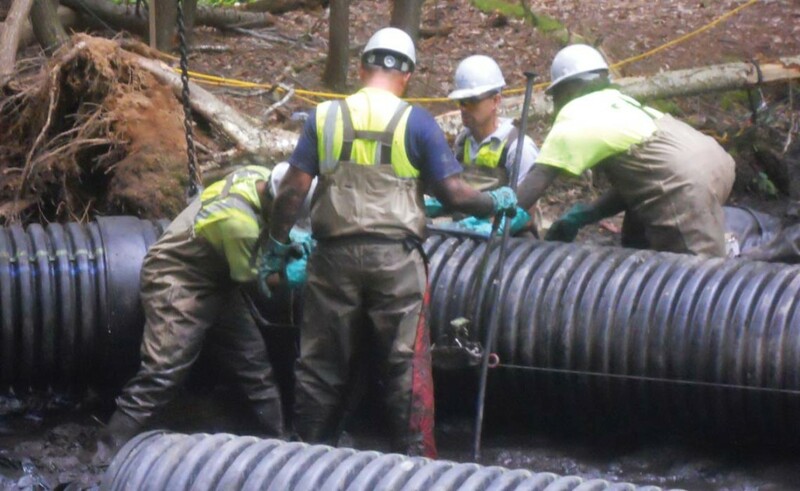 Plastic was overlapped from upstream to downstream so that any water that accumulated on top would not come into contact with the underlying soils and was pumped downstream as clean water.A 24 inch gravity diversion piping system was also installed. Small sand bags were placed along the bottom of the dam and in front of the structure. This reduced the potential for seepage and closed any gaps around the pipe. On the back side of the bladder dam, a smaller secondary sand bag “check dam” was installed within a few feet of the bladder dam as a backup measure to prevent clean seepage from accumulating within the excavation. A small pump was used to re-circulate the clean water collected by the check dam into the 24 inch bypass pipe where it was discharged to a diffuser/scouring pad constructed with blocks and 10 mil poly to disrupt the flow of the water as it is reintroduced into the creek and to prevent scouring and erosion at the discharge point.Water that collected within an active excavation area was tested for radiological contamination. Once analytical results were received clean water was pumped through a 12 inch pipe connected to a filter bag and discharged downstream. 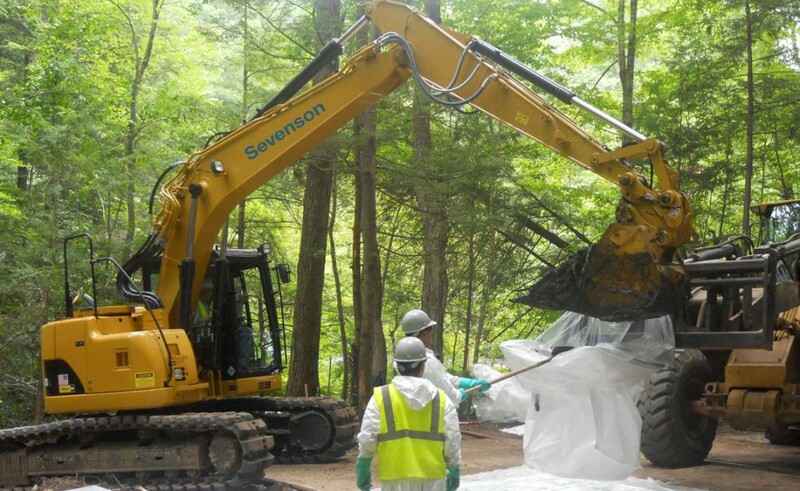 If contaminated, it was pumped to a 20,000 gallon settling tank, filtered, sampled and discharged to the POTW in accordance with the site discharge permit.Sevenson’s excavation was initiated at the upstream areas and progressed downstream. Excavation was performed in one area at a time. 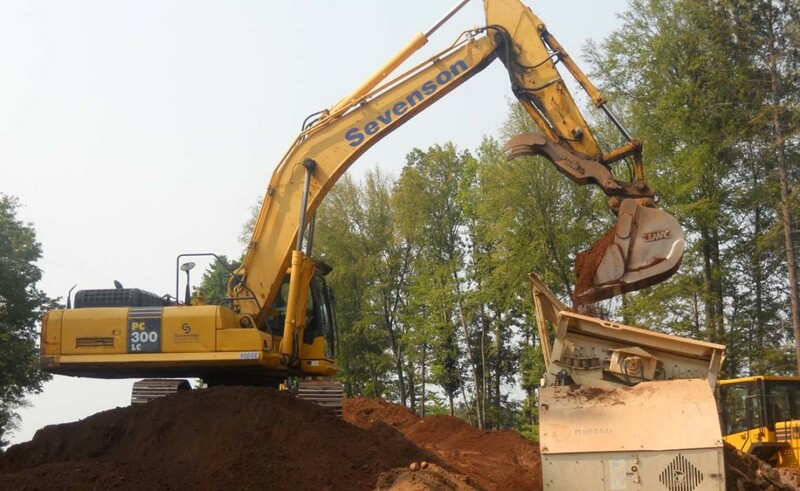 Sevenson prepared the next excavation areas downstream to optimize productivity and prevent downtime once excavation work in an active area was completed. 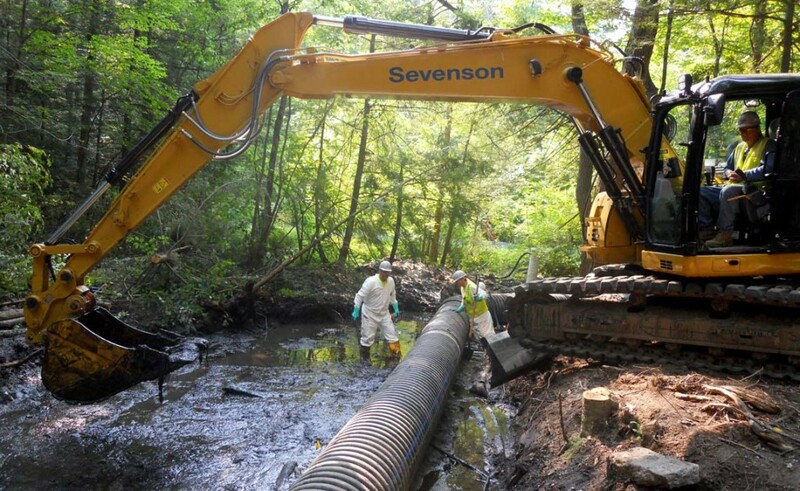 As Sevenson progressed downstream to a new excavation area, decontamination procedures were performed on each piece of equipment as necessary prevent migration of contaminated material out of the exclusion zones. Sevenson excavated the material in 6 inch lifts until the area was deemed clean for radioactivity. Excavated soils and sediments were loaded into 1 ton super stacks and transferred to a staging area for additional dewatering and radiological screening, consolidation and offsite disposal. 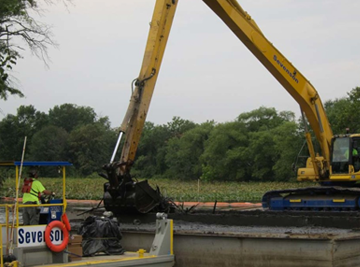 Sevenson removed the contaminated sediment using a mini excavator. The excavator loaded material into a custom fabricated hopper to fill 1 ton super sacks placed on pallets. Once loaded, a skidster with forks transported the super sack to a handling area and into the bucket of a rubber tired loader. The loader was scanned for radiation and transported to a radiological control area for additional screening and consolidation prior to shipment off site. All disturbed areas were restored to its original elevation and conditions. A survey was performed to ensure that the quantities of material placed back into the stream did not exceed the original volume. The site topography and drainage were required to be exactly the same as they were prior to the start of work. 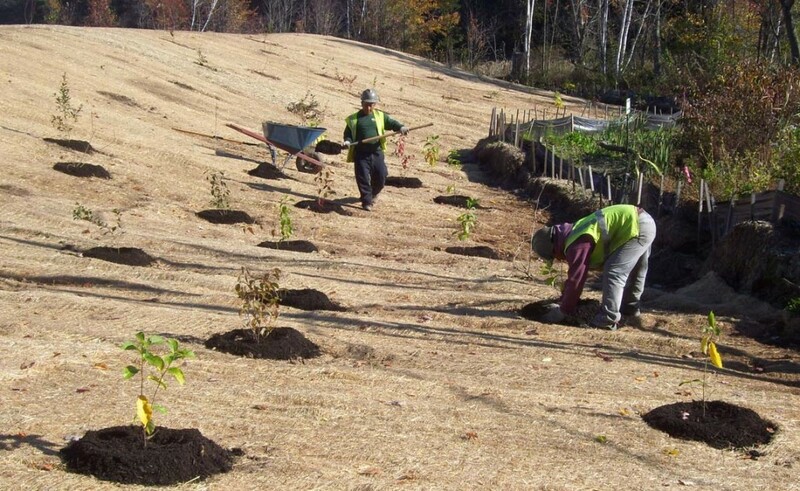 Sevenson contracted a specialty wetlands subcontractor to perform the planting, mulching and seeding. Once the restoration of an area was completed, water was slowly bled back into the creek channel to enable the fill materials to slowly saturate and settle into a natural state. Biodegradable erosion control blanket was installed on each bank to help prevent any scouring from the heavier flows. Stone haul roads were removed. The materials were stockpiled for radiological scanning. After it was deemed clean, materials were reused onsite. A rubber tired loader was used to load small dump trucks with common fill/topsoil and transported to the disturbed areas where material was placed and compacted with a bull dozer. Once design grades were achieved and the area was restored to its original elevations, a final status survey was performed. A 4 acre debris pile was staged in an area of the facility. Access to the pile required clearing and grubbing. Material was excavated and screened and reused as backfill within the area if deemed clean. The material consisted mainly of soil but included a mix of concrete rubble, steel rebar, and wood. Characterization was necessary to determine if any of the material was radioactive. Materials deemed contaminated were segregated and directly loaded into lugar boxes for offsite T+D. Clean material and debris not suitable for backfill was loaded into off road haulers and transported to a staging pad for final disposition. All material was sized utilizing an excavator with hoe ram attachment or manually utilizing demolition saws. 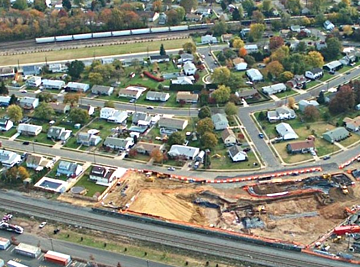 Once the entire debris pile was processed the area was graded and restored. A 100 LF waste line was located in an area of the facility scheduled for remediation. Depth was about 5 feet deep. Prior to excavation and removal of the lines the owner’s representative surveyed several test holes for contamination. Clearing along the footprint of the pipeline was required. 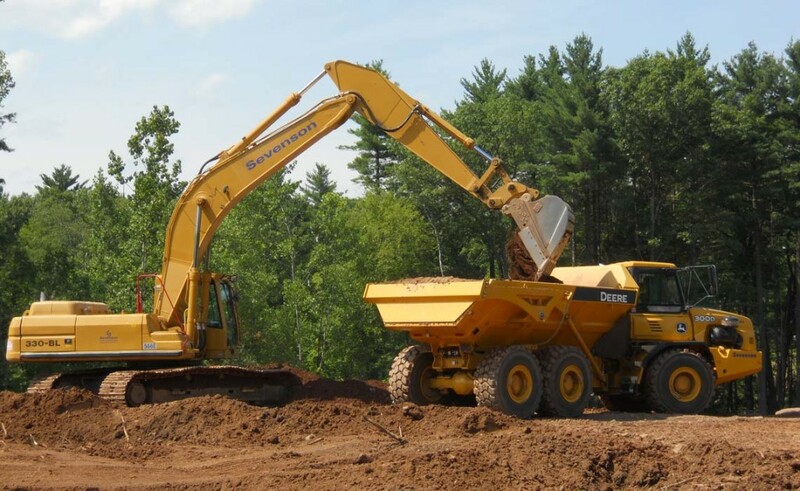 Asphalt and debris was removed and segregated to minimize the amount of material required for offsite disposal, as well as to maximize the amount of excavated material that could be reused as backfill. 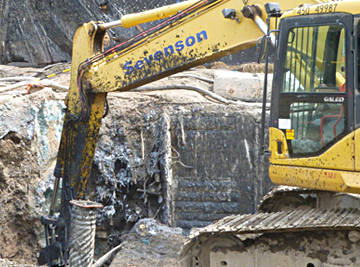 Sevenson removed the clean overburden a safe distance from the trench to minimize re-handling costs. Silt fence was installed around the base of the pile and plastic sheeting was placed over top to prevent dust migration and to keep the material dry for reuse. A temporary chain link fence was installed around the perimeter of the areas as required to provide a physical barrier to eliminate a potential fall hazard and also serve as an exclusion zone.Once the clean overburden was scanned and removed, each section of pipe was separated so samples of the residual material inside the pipe was collected for radiological analysis. The pipes remained in the trench until results indicated the section was clean.After the pipe removal was completed, Sevenson removed the bedding material from the sides and beneath the pipe in 6 inch lifts to allow for radiological screening to determine if the material was contaminated. Additional screening was performed on the side walls and excavation until the entire area was deemed clean. Unique Characteristics: The project required the handling of radioactive and chemical contaminated materials. Stringent controls and countermeasures were implemented. Health and Safety Measures: PPE included Modified Level D. Health and safety facilities included decontamination areas for personnel and equipment. Health and Safety Staff: One full time Health and Safety Officer was onsite to ensure compliance with the Health and Safety Plan and to perform occupational safety and industrial hygiene monitoring.